Based on R.C. Sherriff’s 1928 stage play, which was adapted for the screen four times between 1930 and 1988, Journey’s End takes place towards the end of World War I in 1918, and follows a group of British soldiers who are holed up in the trenches in northern France, preparing for an imminent attack by the Germans. The film takes place over four days and unfolds almost entirely in the dugout, offering a gritty and intimate look at the sometimes mundane day to day realities of war, as the soldiers are made to wait for enemy fire that could come at any moment and claim any or all of their lives. It’s this sense of banality at times that makes Journey’s End such an interesting character piece, as the soldiers share meals prepared by the jovial cook Private Mason (Toby Jones), and mainly just wait to be called into battle. The film features solid performances from its ensemble cast, carried by strong work from Sam Claflin as the alcoholic Captain Stanhope, who is already battle-worn and struggling to make it through, clearly suffering from PTSD. Asa Butterfeld also delivers fine work as the bright-eyed Second Lieutenant Raleigh, a young soldier who asks to be put in the same unit as his old friend Stanhope, but hasn’t quite had the realities of war sink in for him yet. The English filmmaker Saul Dibb directs it with the right mix of simmering tension and character drama, and Laurie Rose’s cinematography nicely captures the earthy tones of the muddy trenches and weathered brown uniforms. This is ultimately a well acted look at men in the midst of war, that wisely keeps its focus on the nuanced interactions between its characters, and does justice to the original play. 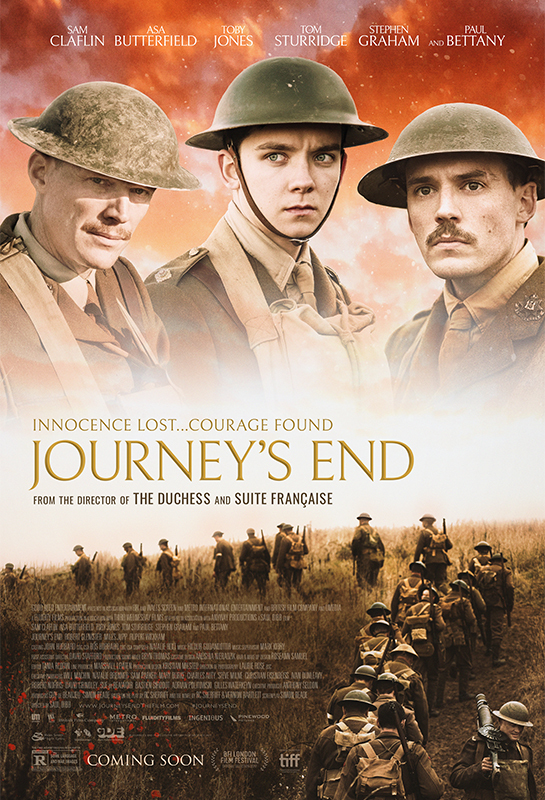 Journey’s End is now playing in limited release at Cineplex Cinemas Varsity in Toronto.